Welcome to World Platter. We understand that with today’s hectic lifestyles, it can be difficult to find time to prepare a healthy, home-cooked meal. WORLDFOODS is pleased to bring you the World Platter where you can embark on a satisfying culinary journey with like-minded food lovers. Nothing bonds people quite like great food! Scrumptious food is meant to be shared, which is easy to do by creating your own social kitchen and interacting with those of others. On World Platter, we also bring cultural insights to the table so that the appreciation of great food by you and your guests goes beyond taste. We’d love to hear from you, whether you are a home cook, culinary connoisseur, chef, foodie whom wants to share your recipes with us. 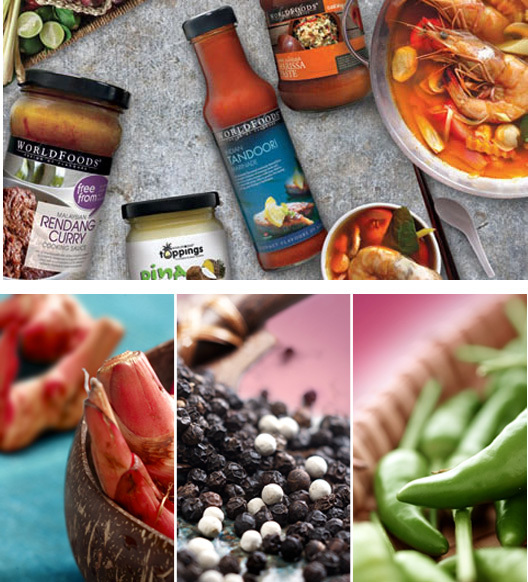 WORLDFOODS sauces go beyond tasting great. They are 100% natural, making us the ideal choice if you are health-conscious and a gourmet at heart. We are convinced that authentic tastes can be preserved without compromising on healthy, all-natural ingredients! Vegetarians, vegans and coeliacs will be pleased to know that our products are specially made to meet your needs too. Strong research and development, backed by a panel of experts comprising chefs, nutritionists, market researchers and experienced food-tasters, ensure that our products not only meet the highest standards but retain the authenticity of their tastes. WORLDFOODS has an exciting range comprising various delicious, authentic world recipes of stir-fry sauces, dipping sauces, cooking sauces, noodle sauces, pastes, salad dressings and marinades. The possibilities are endless, whether you want to recreate traditional recipes or add extra zest to mealtimes with fusion concoctions!